Well, I know I said that I would stick with 4 types of posts on this blog (read my State of the Blog here), but I think I might need to add “Friday Favorites” to that list. I really love favorite things (as you can see here) and at the end of the week sometimes those are the best! 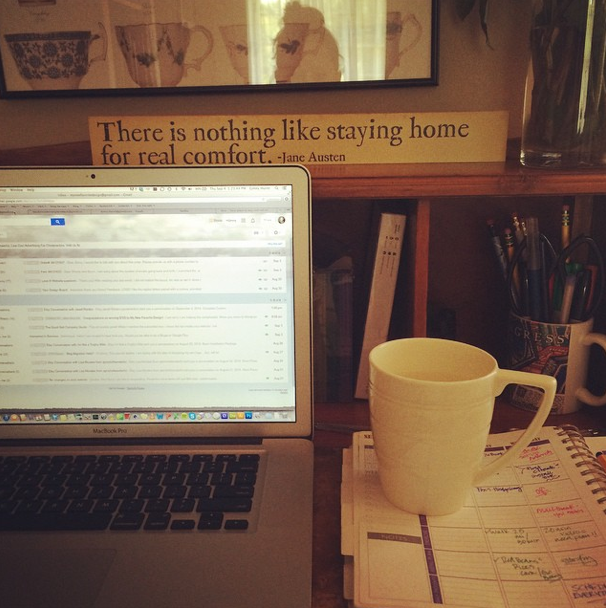 As you know, I started my new job this week and have relished in a week of working from home. It’s glorious, y’all! I just wanted to share a few things that have made working from home awesome – and then ask you for your working from home tips! Obviously, I love having unlimited time to work on my website/blog design business. This has been such a blessing. I am not staying up to 2 am anymore – because I get so much done during the day! Praise the Lord. I can surround myself with everything I love. As you can tell from the photo above, I love hot drinks (hot water in the picture – that deserves it’s own post), planners, flowers, candles, pretty music – and come 3pm I pull out all the stops! It’s really the best way to work. Ever. Lastly, I love not putting on makeup in the morning. I’m not the biggest fan of a full face and full hair right when I wake up – and I love lounging around and letting my face breathe all morning :). I’ve started freshening up and doing the face in the early afternoon – especially so I can greet my man with a little lipstick and mascara. But, that early morning fresh face is awesome. I really am interested in hearing all about your “stay at home” tricks! Do you have an ideal time to exercise? Grocery shop? Clean the house? I am planning on scheduling things every week – so PLEASE leave your favorite tips! I can’t wait to hear your thoughts! Linking up at: Friday Favorites, Oh Hey Friday, and High Five for Friday.